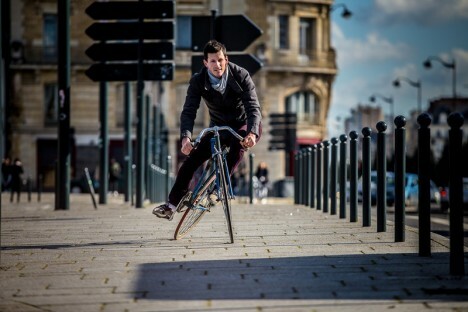 Professional bicycle racer Johan Le Bon has been co-developed a strange single-speed city street cycle that pivots in the middle of the frame, allowing the back wheel to twist and swerve in ways that, at a glance, make it look like it is about to fall apart. 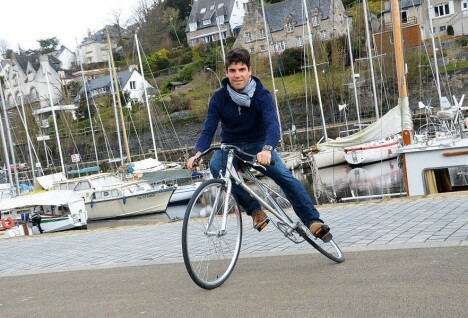 Created with two his friends in Brittany, France (Alban Haloche and Alexis Honoré), the project has been nicknamed the “Trocadero” and lets riders steer with their hips. The result: users can turn in ultra-tight circles and slalom urban street obstacles with ease. Its makers claim it only takes a few minutes to get used to and a few more to master its use. For riders wanting to switch back to ‘regular’ mode, a simple pin inserts to turn it back into a normal fixed-gear affair. Thanks to the bicycle’s viral popularity, the creators are making a limited run of 30 vehicles for now to see how serious outside interest really is. It remains to be seen if this is a one-off quirky invention or a serious next step in the future of cycling. See more in Bikes & Cycles or under Transportation. May, 2016.